Hey guys, sorry for my flatlining on the blog. You might’ve seen my tweets where I was actually considering quitting and deleting this blog, because I was just really not feeling it. But today I feel like blogging! Hurray! Let’s just hope this phase will last this time! 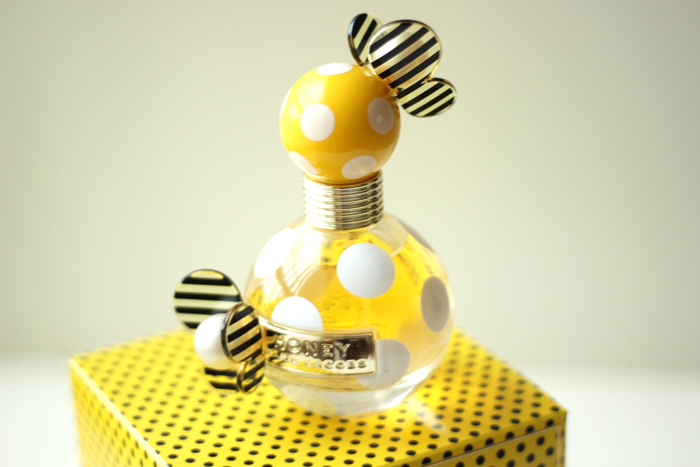 Anyways, I wanted to review you a new product that’s just been launched by Marc Jacobs – the Honey fragrance! I have to admit I didn’t know what to expect when I received this, because I have never owned a Marc Jacobs perfume. I tried the Ladybird (Dot) and the Daisy ones in the shops multiple times, but I just didn’t get the hype. Yeah, the designs were cute, but the scents were meh. But of course I won’t say no to reviewing a Marc Jacobs fragrance. I felt honoured to be contacted as it is! But I really didn’t know what to expect. So I was blown away by the scent (and the adorable design). The scent is a very light floral one, with top notes featuring a mixture of pear, mandarin orange and punch, while the middle notes are a combination of honeysuckle, orange blossom and peach and base notes are honey, vanilla and woodsy notes. So and overall sweet, floral and fruity scent – just as you would expect from a fragrance called ‘Honey’. Although I would’ve expected the actual honey-aspect to come through stronger! But it doesn’t, which btw I a good thing in my eyes, because it could’ve made the perfume sickeningly sweet and heavy! Of course the new Marc Jacob Honey range also includes a body lotion and a shower gel, and the Eau de Parfum comes in a 50ml and a 100ml version, the latter two retailing at £50 and £68 respectively, all available at places like Boots and so on. While that is quite some price tag, if you’re into light, floral scents and cute packaging, this is definitely is worth checking out! But there are of course cheaper alternatives too! And by the way, Marc Jacob’s actually have a brilliant campaign running using Instagram at the moment, that sounds like a lot of fun! 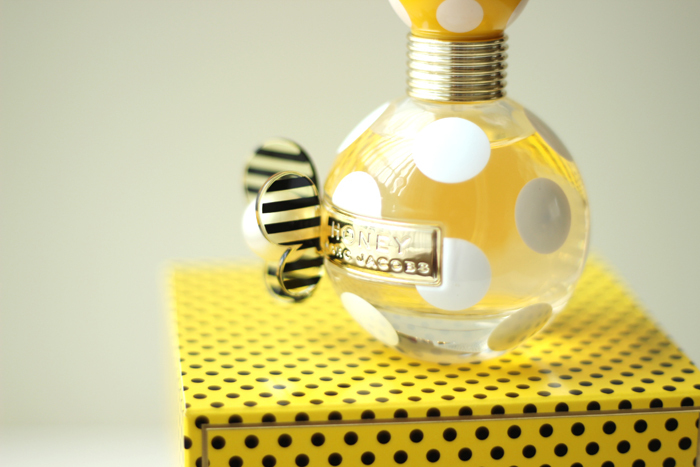 The hashtag is #MJHoneySpots, which can lead you to winning 1 of 32 Marc Jacobs fashion and fragrance prizes! Ohh I got this as well, and I really love it! I actually haven’t smelt anything similar, so it’s fairly unique for me! I’ve been trying to decide on a new scent-I’m going to check this out. Thank you!